^ 菲律宾介绍. 北京: 中央人民政府情报总署资料室. 1951年. 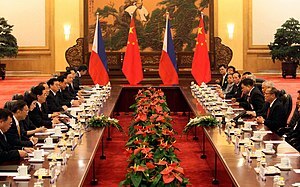 ^ Creeping Assertiveness: China, the Philippines and the South China Sea Dispute. Contemporary Southeast Asia. April 1999, 21 (1): 95–118. ^ 6.0 6.1 6.2 6.3 中国同菲律宾的关系. 中华人民共和国外交部. 2015-07 [2016-09-08]. ^ 庄红韬. 菲律宾概况. 人民网. 新华网. 2003-08-30 [2016-09-08]. ^ 馬尼拉華埠 歷史最悠久. 台北: 行政院僑務委員會. 2016-03-16 [2016-09-08].